Made in the USA. 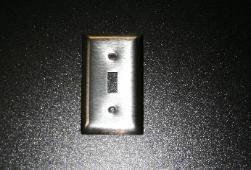 Stainless Steel Wall Plate One Gang Toggle is the perfect accessory for any place where you are using our Stainless Steel Tiles as a backsplash or accent. Alternatively, you can enhance the modern appearance of any decor.